A sun-filtering, 20-metre-wide curtain hangs in the entrance lobby of the Chazen Museum of Art in Wisconsin. The curtain pulls back along a spiral-shaped ceiling track. 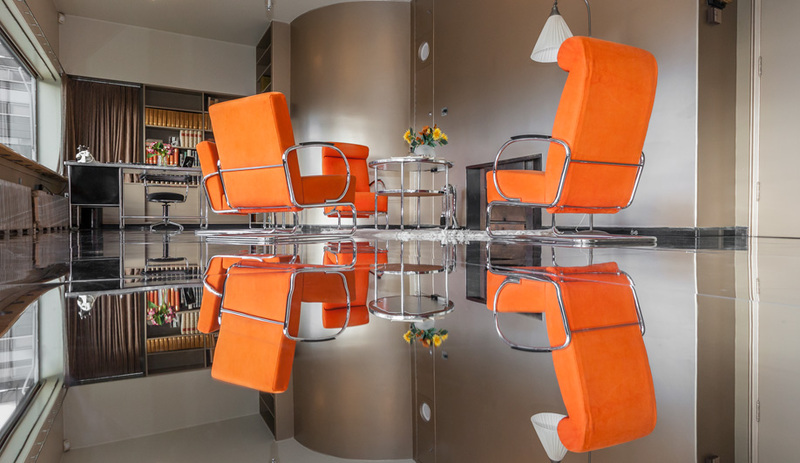 For a temporary installation inside Rotterdam’s Sonneveld House Museum, Blaisse covered the entire floor with mirrors. Blaisse’s curtains weave through an exhibition of furniture by Pierre Paulin, on view last year at the Centre Pompidou in Paris. Petra Blaisse has carved out a 30-year career creating massive curtains (that double as semi-permeable interior walls) and simultaneously engaging in another space-transforming pursuit: landscape architecture. We caught up with her to discuss how her two creative occupations tie together. You’ve said you do “everything but architecture.” When you started out in 1987, how did you define your scope? I didn’t define it literally. In art school I had a weakness for creating three-dimensional environments. I later became an assistant curator at the Stedelijk Museum in the applied arts department, which is where you have all the disciplines, with the exception of fine arts, as subjects: architecture, design, crafts, photography and graphic design. So, it wasn’t like, “Oh, I want to go into architecture.” It sort of grew by itself. I was working with OMA in the late ’80s, and they were working on a dance theatre in the Hague. 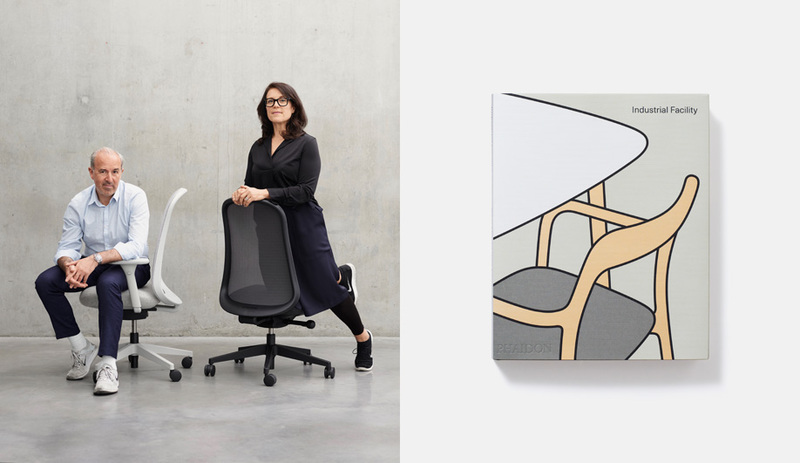 Rem Koolhaas had recognized some kind of talent in me, so he asked me to join his team to help influence the interior by choosing finishes for floors, walls and so on. When it came time to think about the stage curtain, I said, “Well, I can do that. I’ve never done it before, but who cares?” So that was a beginning. The Dutch Dance Theatre is really good, so we were very motivated to do everything we could do to give them the best possible theatre and workplace. Two layers of curtains surround the auditorium inside Bibliothèque Alexis de Tocqueville in France. The building, by OMA, was completed earlier this year. How did your relationship with OMA evolve from there? real architecture office – meaning, trying to build buildings – so it was a very young office with a small team. Of course, I became independent from OMA at a certain point, which is always good – to emancipate and do your own thing and work with other architects. I love how you use the word “emancipate.” You also say that your curtains are emancipated from the architecture. What does that mean in terms of how you view your role working with architects? 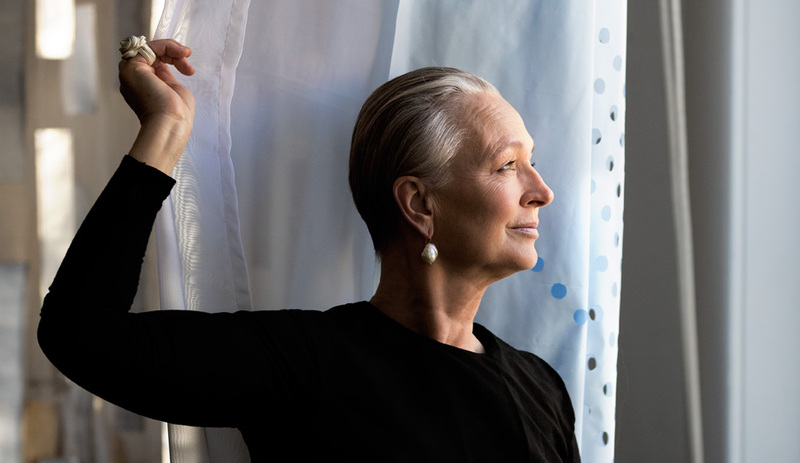 I think it’s fun to make emancipation a kind of metaphor, because I’m designing gardens and interiors – which is always equated to being a woman and representing the feminine side of architecture. That’s not an insult. But if people say, “You bring the warmth into the cold, inhuman architecture of OMA,” or any other architect, then I get a bit angry. It’s not that simple. First of all, our work has muscle, and, secondly, architects generally have enormous sensibility. 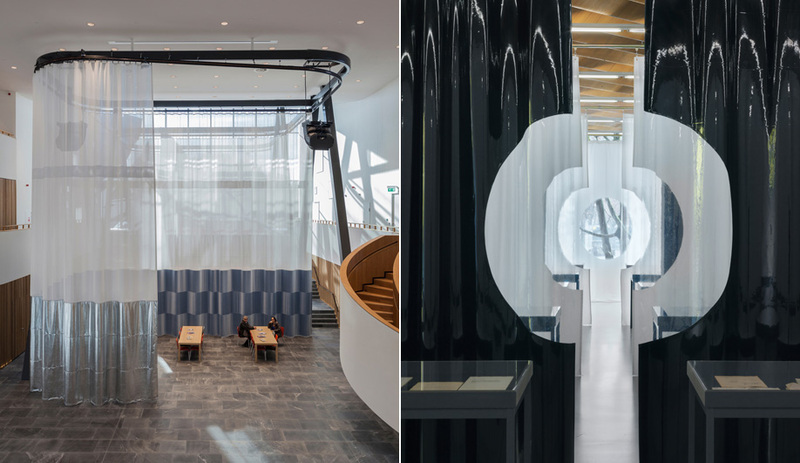 Left: Velour, faux leather, PVC mesh and transparent plastic are some of the materials used for a series of six dividing curtains installed inside a commercial bank in the Netherlands. 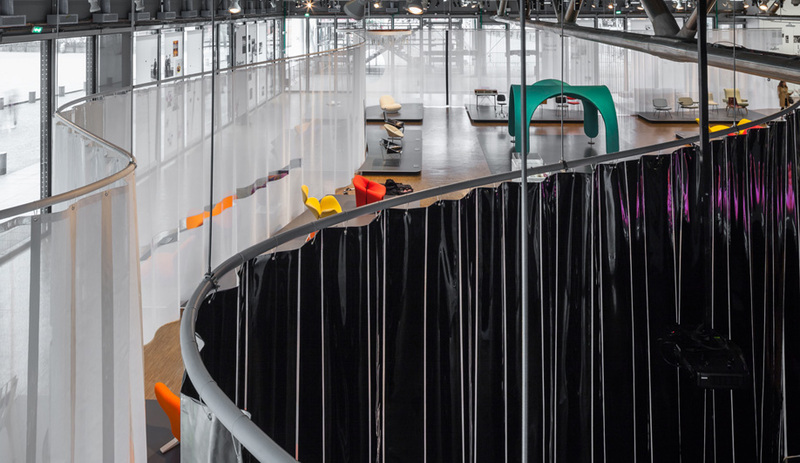 Right: Seven layers of curtains, two of which are made of black PVC, are installed as part of an exhibition space at ETH Zurich. The idea of the curtain does have a very feminine tone to it. The curtains you’ve created, though, are epic in scale, like worlds unto themselves. To me, the curtain is connected to the landscape. 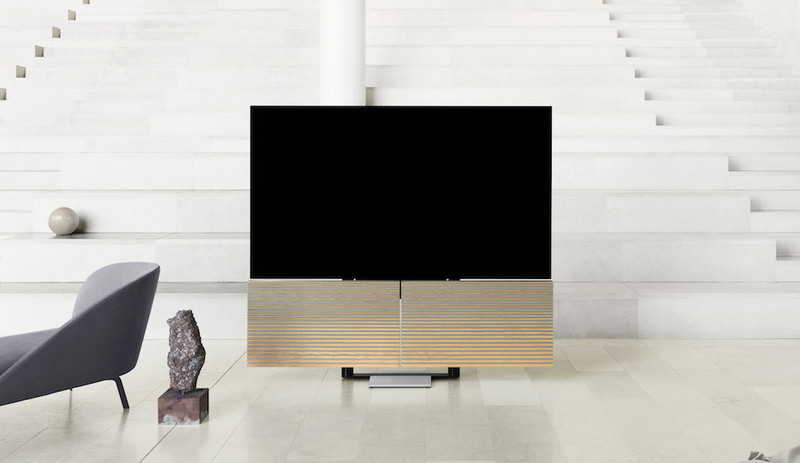 If you think of planting and filtering and creating screens that change through the seasons, becoming opaque during spring and summer, transparent during winter – all these things are the same language. Of course, it’s not textile but living material. And both curtains and landscapes are not only technically important to architecture, they are also a recognizable, almost consoling, presence. Concept drawings for a project with French architect Jacques Moussafur. You’re also creating photovoltaic curtains. We’re actually going to look for sponsors and partners to continue this research, because it’s still primitive. Everyone is searching for ways to catch the sun’s energy, but what is special about our research is that this is a curtain for public space, and on a huge scale. So it should also be very convincing as a beautiful, functioning curtain. In other words, it has to cool, shade, darken; it has to be able to do everything. 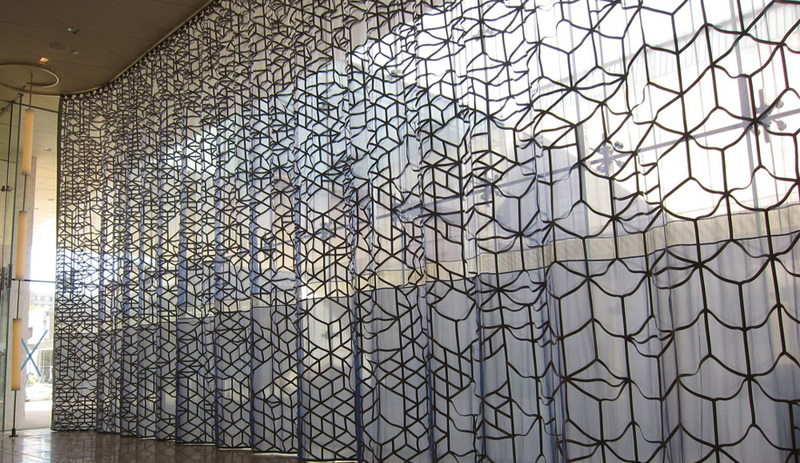 For Qatar National Library, you designed a Jacquard woven curtain inspired by astrolabes. We’re hugely inspired by all the cultural meanings of textiles. 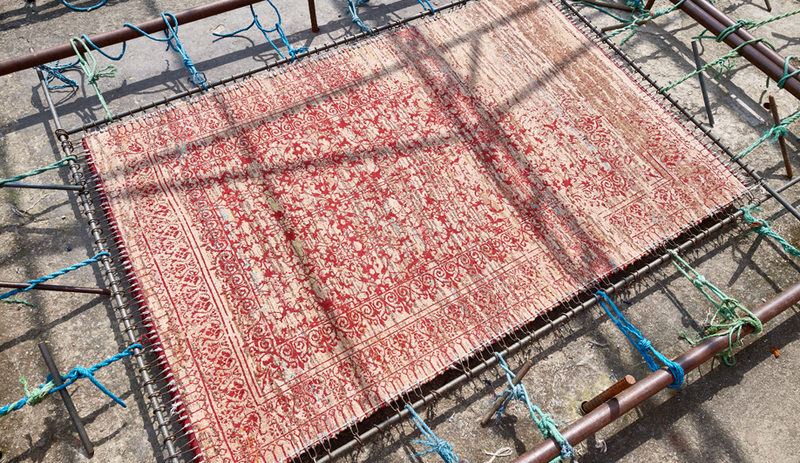 In the Middle East there is a strong tradition of carpets that, through their patterns, represent the world or daily life, often in the form of a garden. They are actually metaphors woven right into the medium – often hiding secret messages of the makers. For me and for many of us in the West, we don’t like to be that literal; modernism and abstract art is in our blood. 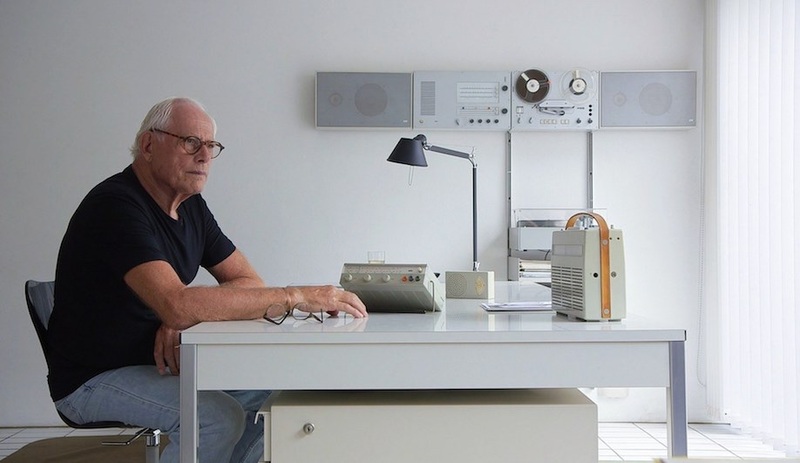 But both worlds influence each other, so even if you’re very minimal, you retrieve it from a source, which is life – all the sources of inspiration that you come across. For the Qatar Library curtain, we wanted to do something linear and free of colour. At first, we tried lyrical images to make connections to the garden, which we also designed. But none of us were happy with the results. In Qatar, the nights are very fresh and clear, and you can see a fantastic number of stars, and that image is a very multi-interpretable metaphor. The night sky can simply mean planets and stars and the heavens, or you can give it religious or philosophical meanings. And then these astrolabe measuring instruments, which we included as a pattern in the curtain, they have their own beautiful language. In Islam, you can’t represent human figures, but you can represent floral or abstract figures, and these measuring tools are very decorative. 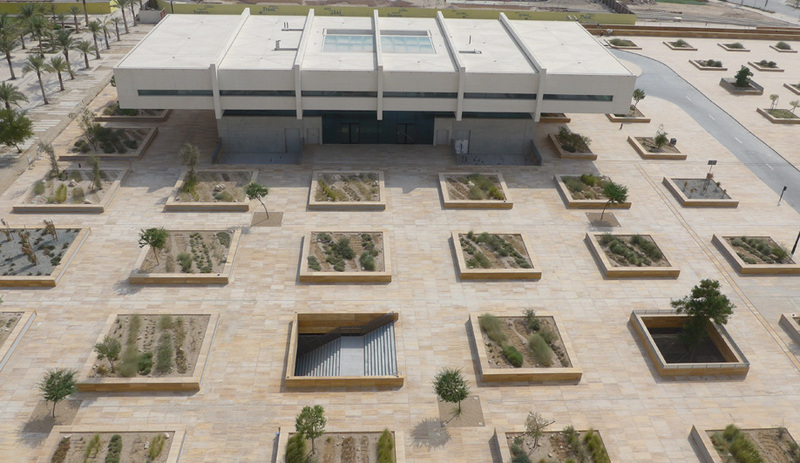 A grid of planters filled with native desert foliage surrounds Qatar National Library, which is slated to open later this year. You also designed the landscape for the library, a grid of planters filled with desert plants. What did that project mean to you, in terms of the tapestry you were creating? It was like a reorganization of the natural planting communities, as if you’re making a botanical garden. We couldn’t take the plants literally from nature because nature is so protected; the government is very strict about that. So we are recreating it with the help of local botanical specialists who’ve spent their lives studying the desert. As amateurs, we look at the desert and think it’s just sand. But sand is also soil, and if you water it, or if certain values change, the planting changes as well. Our garden is like an archive of this moment in time in the Qatar desert. Who knows in 10 years what will be left of it? Our hope is that the Doha universities and the Qatar Foundation Green department will actively adopt this garden. There’s lots of work to be done, including, among others things, to create a nameplate for each plant. 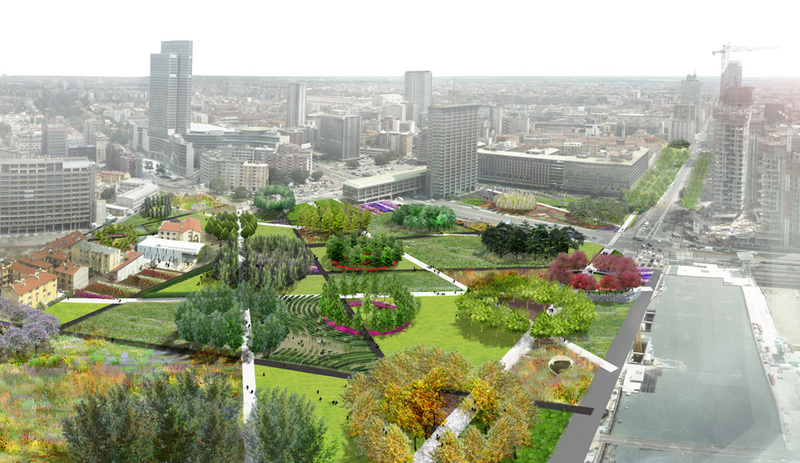 Blaisse, along with a team of firms, is behind a master plan in Milan to add streetscapes and parks to Giardini di Porta Nuova. The street and park landscaping you’re doing in Milan’s Giardini di Porta Nuova is also ambitious and years in the making. How do you convince a city like Milan to take on such a large project? What was most difficult was convincing the city of the complexity of the planting, because most parks are usually lawns with trees and shrubs. We have four different kinds of fields, some referring more to agriculture, more linear plant systems as you would have in France – lines of lavender, lines of tulips. When you stand in certain places you see rows, but if you move along it becomes a whole field, so you have a visual change as you drive past or walk past. And then there are fields designed by Piet Oudolf, the Dutch master planting designer who became famous with the High Line in New York. I asked him especially because we wanted to do these fields with real garden typology, with different grasses and perennials and bulbs to create lyrical carpets, if you will. So that’s the second kind of garden. Then you have a lawn for people to relax and play on, and meadows – a mix of wildflowers and grass. If you mow them, you can use this field as an enlargement of space. And then it can grow again. So the challenge for the city of Milan is to maintain it in four different ways. One of your best-known curtain projects was shown at the 2012 Venice Biennale. It was programmed to glide across the ceiling on a motorized track. It was kind of a challenge to viewers: will you stay and experience this? It seems that most people will stick around long enough to “get it,” but not to actually experience it. Is that a problem for you? Not for me, but I think we should all realize the phenomenon of impatience and be aware of it. In our Western culture we think our lives gain meaning if we work hard and do many things. Especially professional women, but also men; we all feel the pressure of ambition and performance. For me, I only respect myself if I do everything. I can’t just be a housewife or a maker, or the daughter of my mother, or the lover of my husband. I have to be everything. In one sense that is fantastic, but it also means we tend to not take time to digest what’s going on. This is certainly the case for me. Experiencing art and nature offers welcome moments of meditation, and you have to open yourself to the vibes and languages in order to recharge and gain new perspectives. I wish I’d been in Venice to see it. There were people who really stayed for the entire cycle of the 12 positions of the curtain. But for the impatient who wanted to “check, check, check,” it was also interesting, because as you go in and out, in and out, there’s a different world waiting each time. I think what connects all my concepts is that they look very simple but are incredibly complex. And it’s not bragging; it’s that I realize that, OK, you have this idea and you can sketch it in two or three lines, but then to really realize it, it’s an enormous multidisciplinary undertaking. Oh, OK, you know? – a desert garden in the city. Petra Blaisse was interviewed during IIDEX Canada in Toronto.